July is a wonderful month for local food on Vancouver Island, and Our Big Earth, Brambles Market and EatRealEatLocal.ca have teamed up to encourage us enjoy the bounty. Together they are hosting the "EatRealEatLocal 30-Day Food Challenge" inviting Island inhabitants to sample locally-produced foods whether dining out or at home. Throughout the month there have been several events highlighting local foods. Sadly, in the midst of all the return-from-holiday/return-to-work kerfuffle, I have had to pass on most of these events. Monday was my lucky day though. 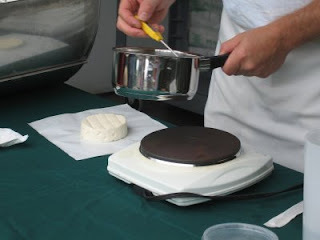 I just happened to have the day off, and Natural Pastures Cheese Company was having an in-store demo. How could I resist? Years ago Dad worked for Silverwood Dairy. On one occasion my sister and I got to visit him at work. Though we weren't allowed in the work area, we were able to watch the action from above. We stood with our noses pressed against a window directly above the milk processing area. I don't remember many details of the work taking place below, but I do remember making silly faces at Dad and his co-workers. Imagine my delight when I arrived at Natural Pastures to find a row of children with their noses pressed against the window watching Master Cheesemaker Paul Sutter set up for the demo. I felt like I fit right in. As at Silverwood, the public wasn't able to tour the Natural Pastures work area. 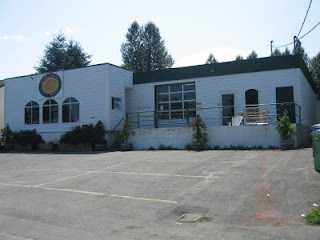 Instead they opened the large window at the front of the building, and Paul gave an informative mini-demo of the processes involved in making their award-winning Comox Brie and Camembert. 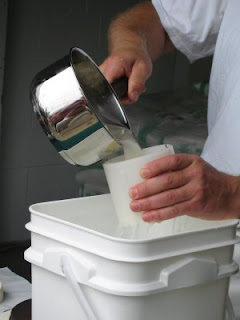 First step, heat the milk to the correct temperature. ... and poured it into a mould. 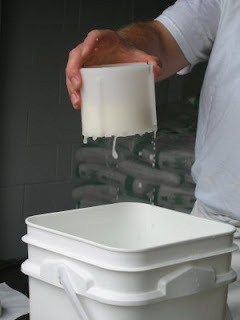 During regular production over 200 moulds are used for each batch of cheese. The filled moulds are turned regularly. After the demo there were samples available in the cheese shop. It was difficult to decide what I wanted to buy. After much tasting and consideration this one followed me home, as did a package of Aged Farmhouse. As you can see, these cheeses don't last long at our house. It's a good thing I snapped this picture when I did. 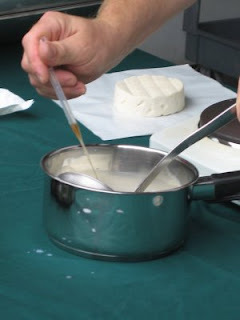 Of course, the demo only provided a taste of the cheese making process. For a more complete picture, check out Natural Pastures website. 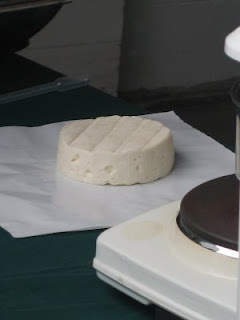 There they outline the basic steps of cheese making on a larger scale. Or, if you think a taste of the process (or of the cheese) would be to your liking, there are two more demos planned for this month. 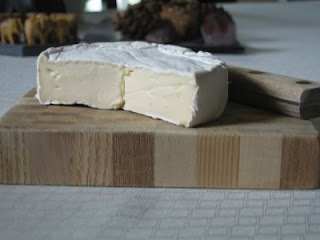 On Monday, July 20th Natural Pastures' Dutch cheeses will be featured, and on Monday, July 27th Natural Pastures teams up with Bite Size Specialty Foods for a cooking demo and tasting. 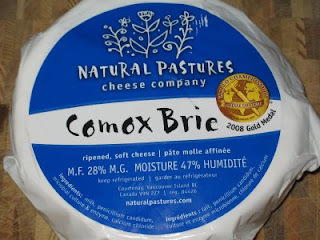 The demos take place at 11am, noon and 1pm at Natural Pastures Cheese Company, 635 McPhee Ave., Courtenay, BC. Hi Bookgirl! That sounds like a heroic amount of work. Good for you. I must admit that I'll NEVER be that ambitious. If they could, I'm sure they'd revoke my Ukrainain heritage, as I make cabbage roll casserole rather than go to the trouble of rolling the suckers. Yesterday, when looking for recipes using grape leaves, all I could find were instructions for dolmades, and dolmade-like rolls. As I am very lazy, I gave up on my search for tested recipes and decided to wing it. I steamed some beets. When they were almost done I tossed the grape leaves on top of them and steamed them too. When the leaves looked done I put them, then the beets, in ice water to cool. The leaves went on a plate, then I added the peeled, chopped beets, a homemade vinaigrette, feta and pumpkin seeds. (I added the seeds because they were the same colour as the leaves were after steaming. I thought it looked pretty.) Beet and grape leaf salad. It was good. Even hubby thought so.